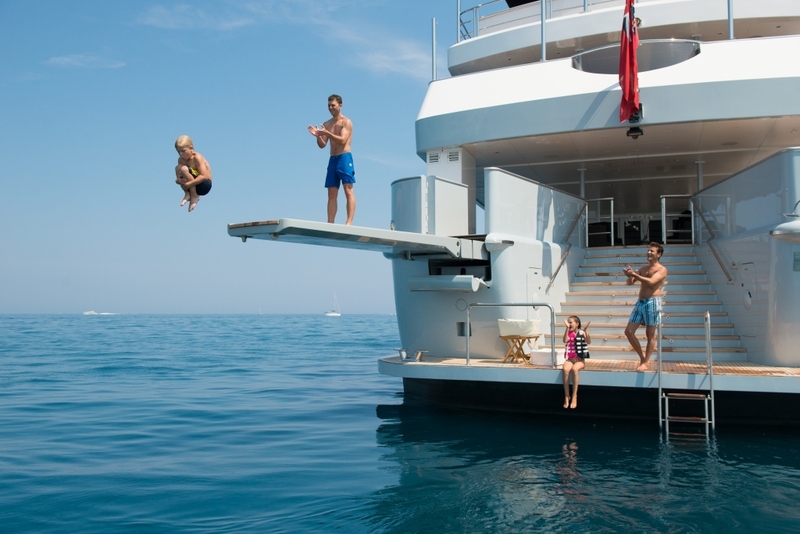 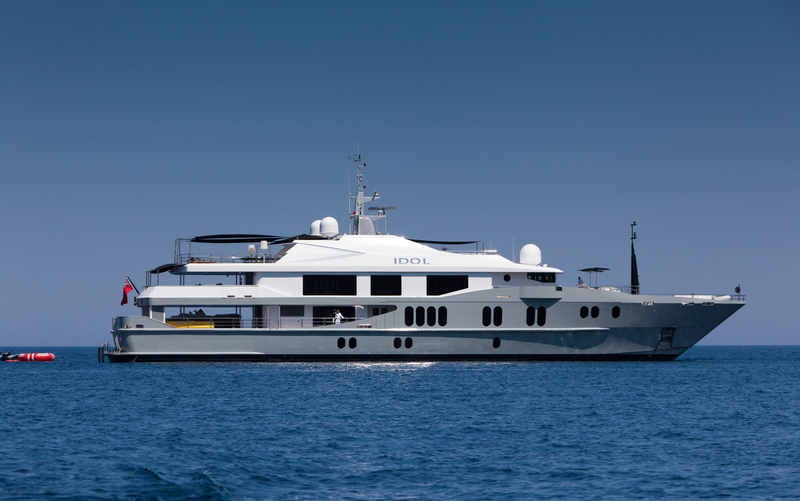 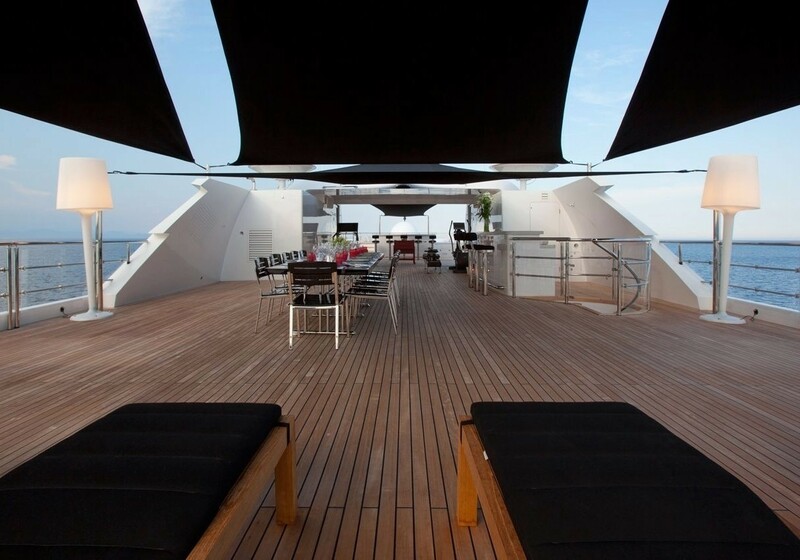 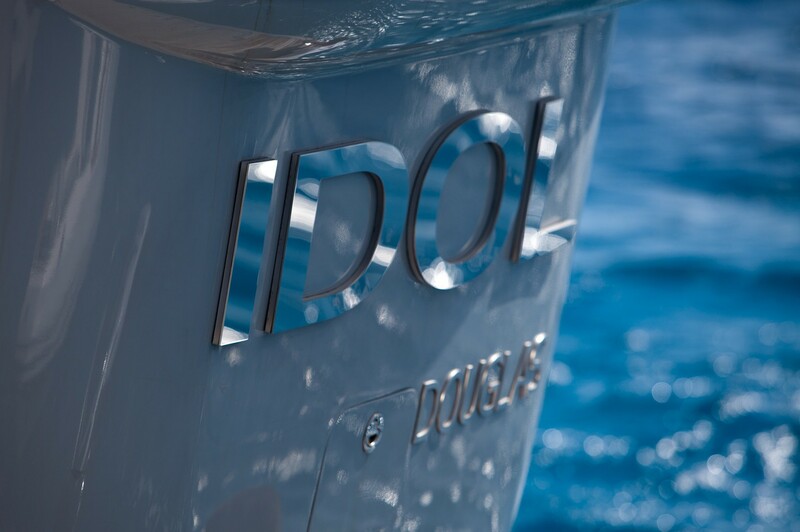 IDOL (ex OUTBACK) is a fantastic 58,8m Austal luxury yacht launched in 2007 that has benefitted from a refit in 2011. 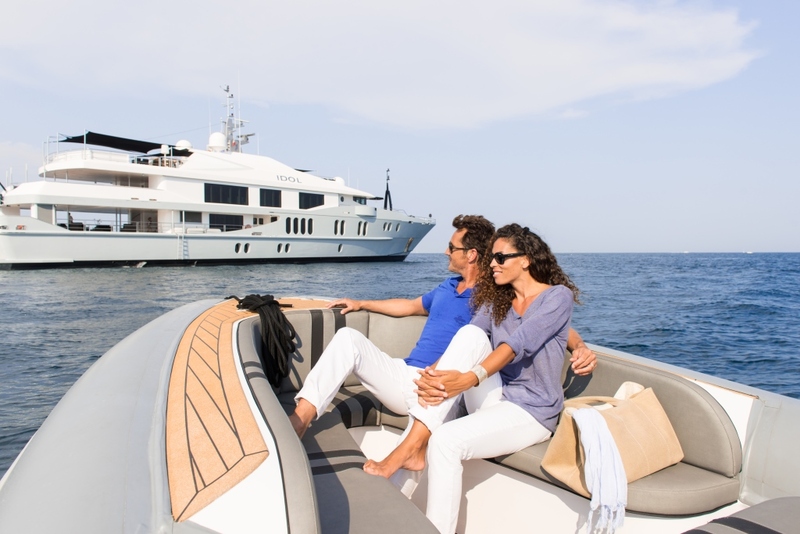 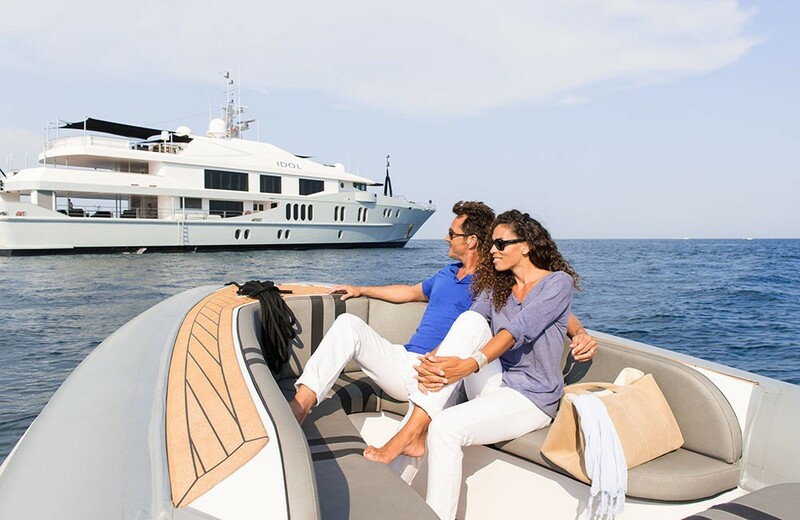 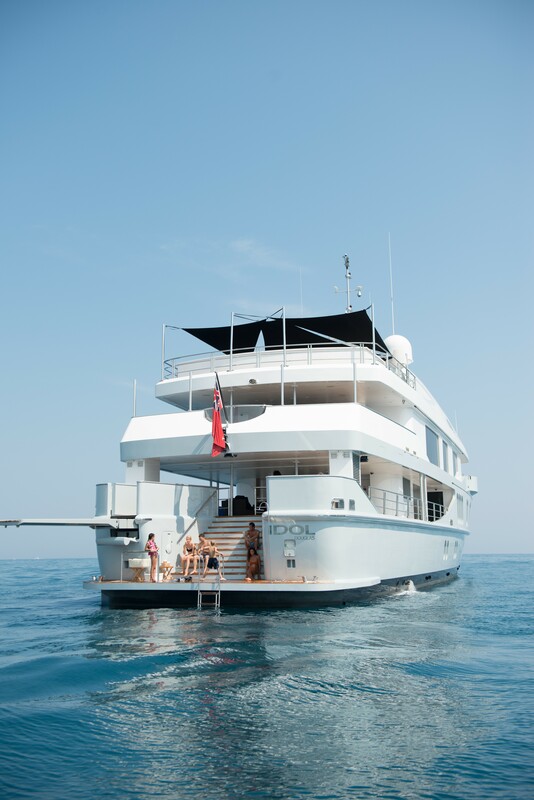 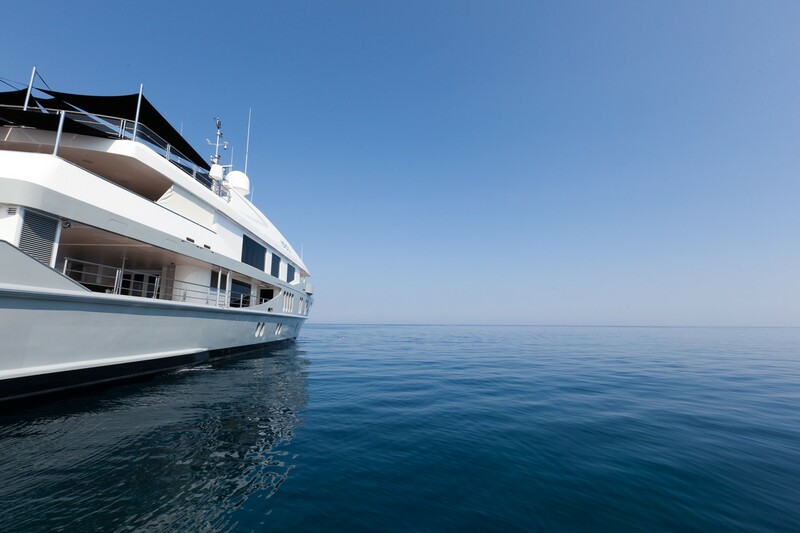 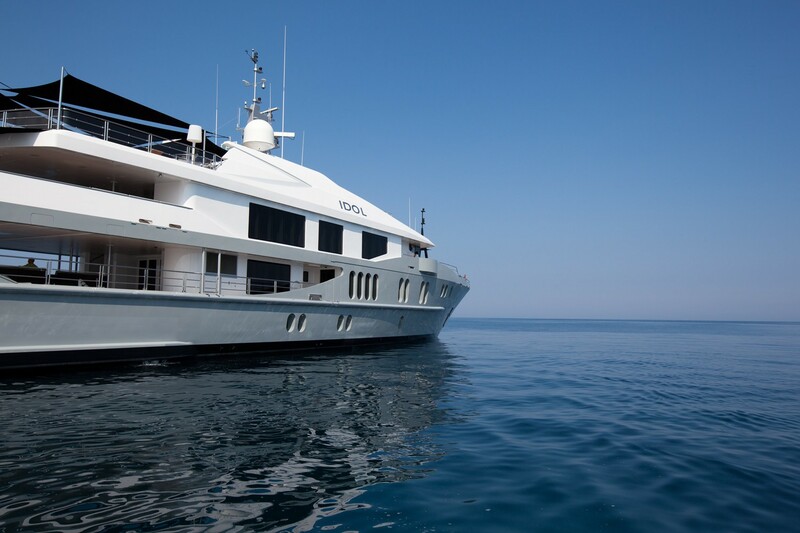 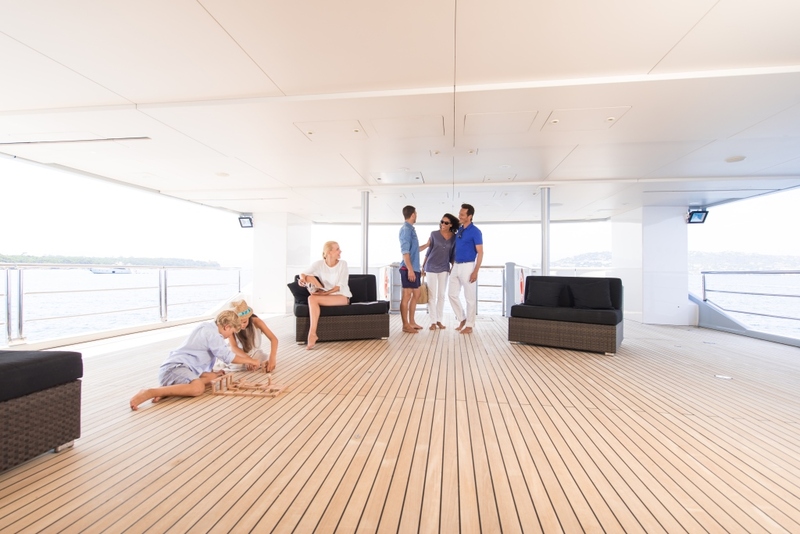 She accommodates up to 12 guests in a 6 cabin format, with 6 doubles and one convertible. 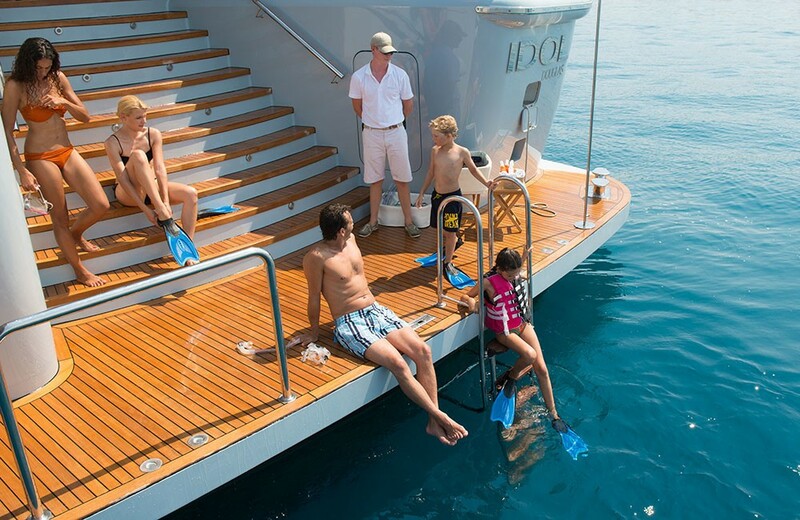 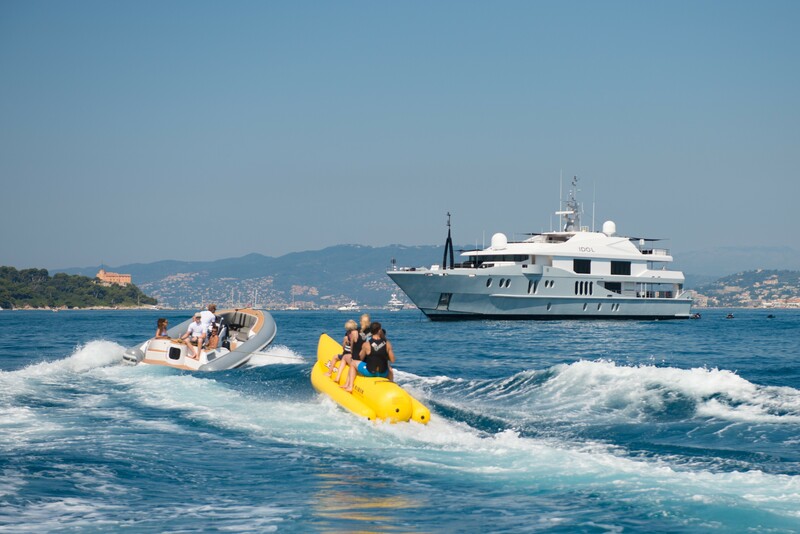 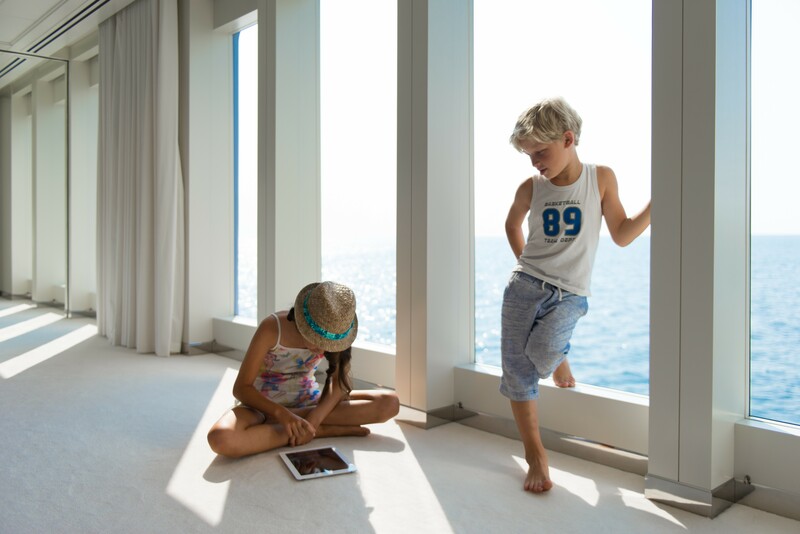 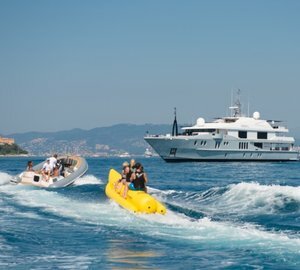 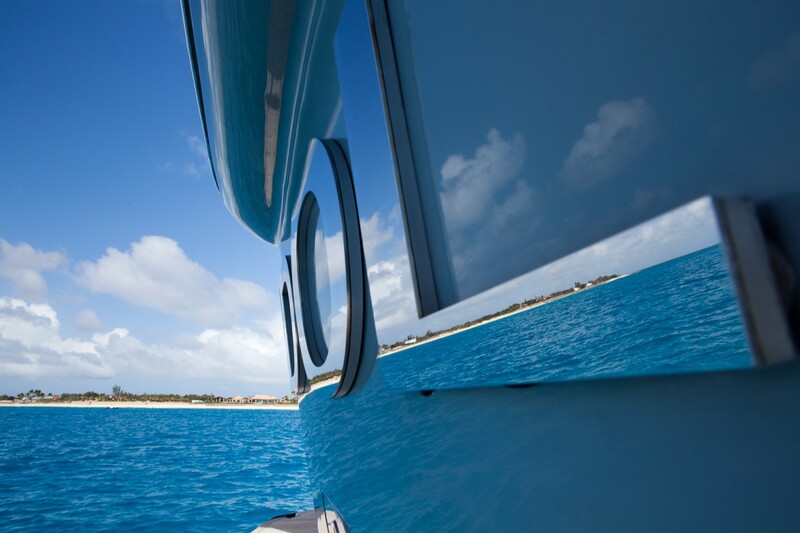 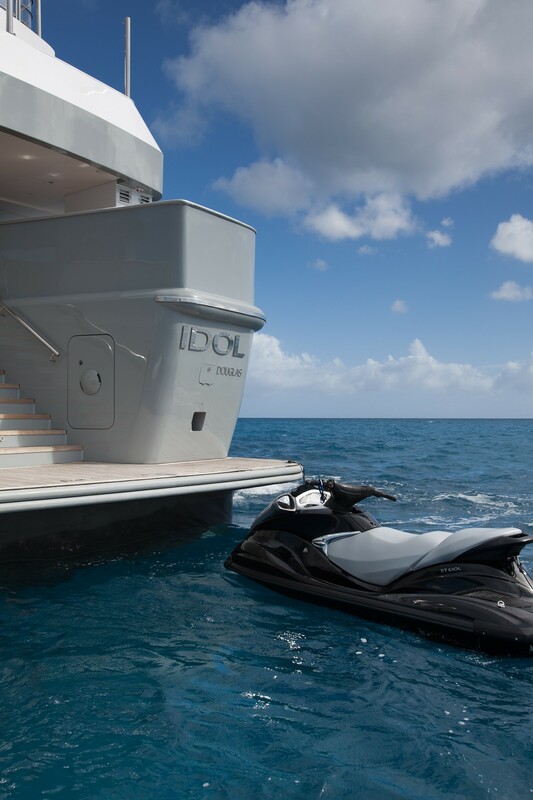 IDOL has a spacious ‘clean’ or uncluttered modern interior, luxurious accommodation and an enormous array of water sports equipment. 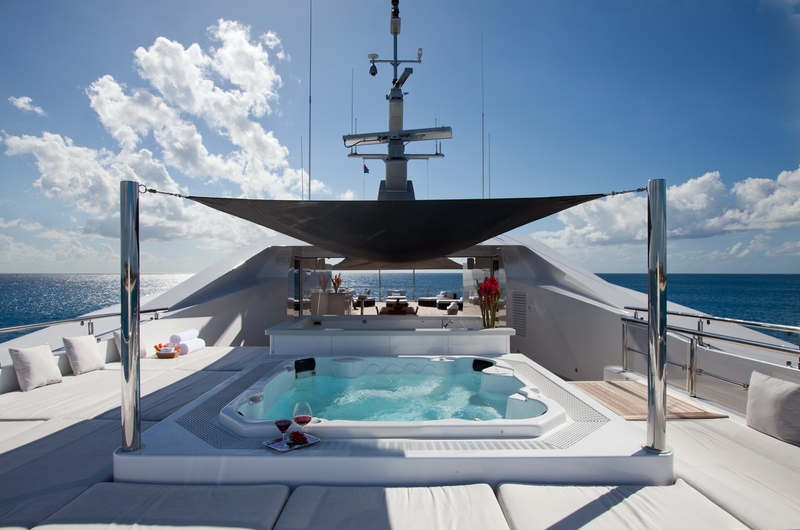 These features make her ideal for relaxing holidays. 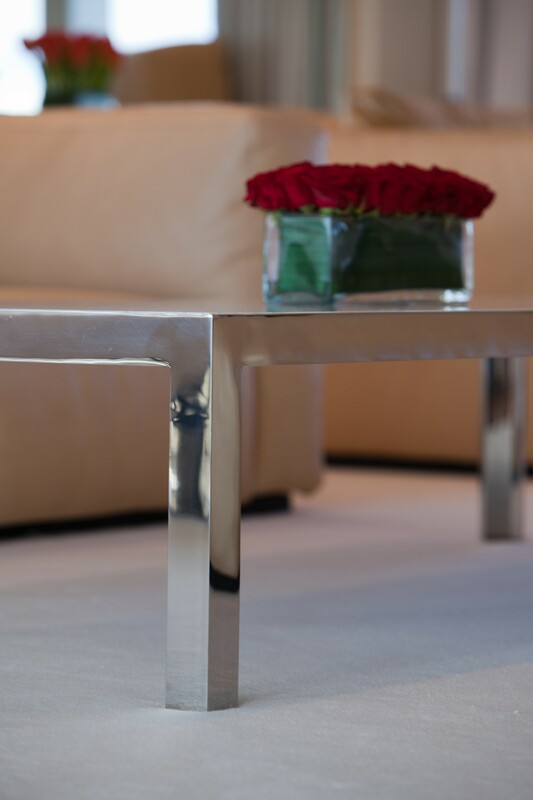 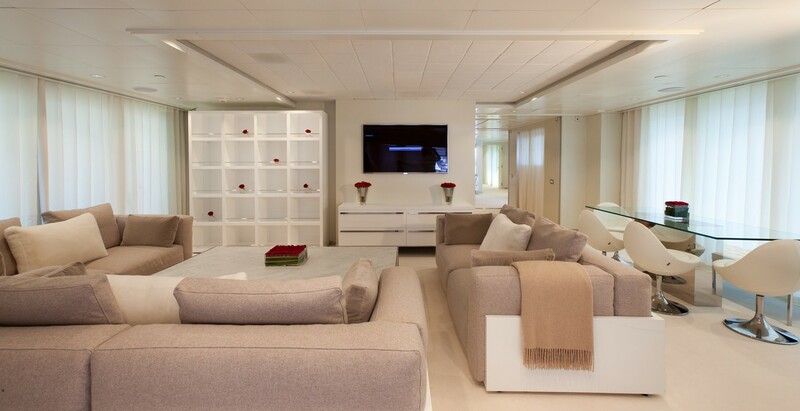 The main salon is very comfortable, with a large leather sofa and marble top coffee table surrounding book shelves. 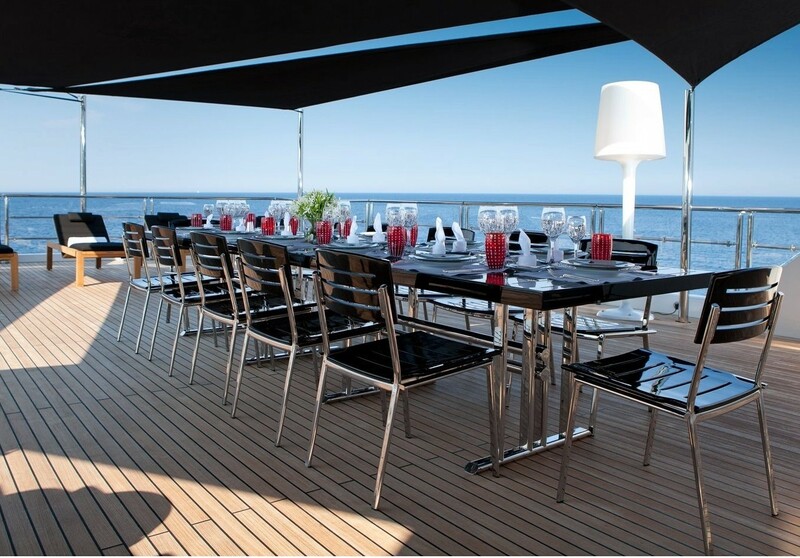 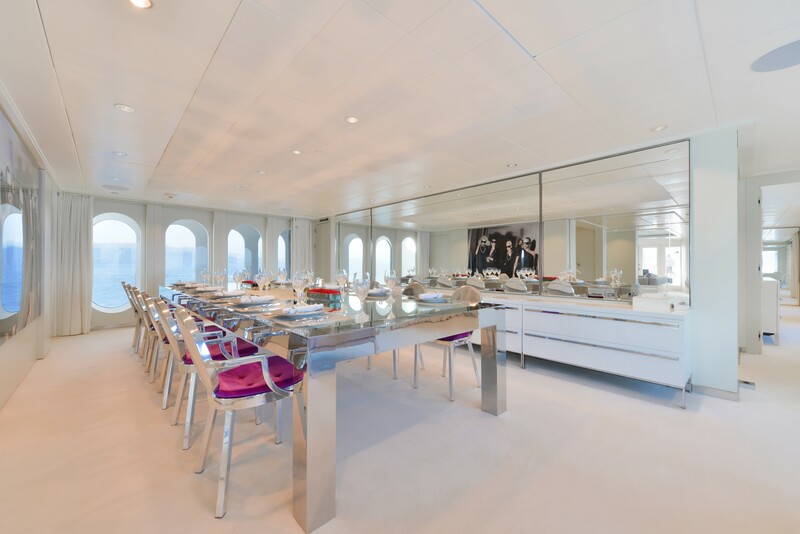 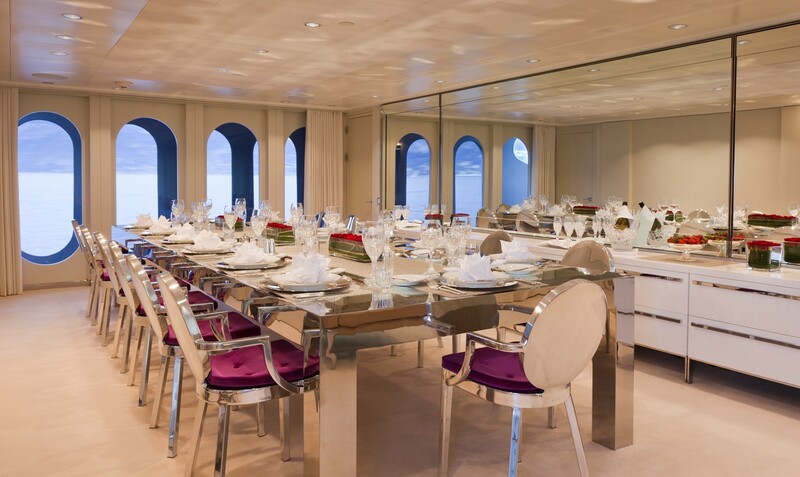 The dining area can fit 14 guests in full comfort. 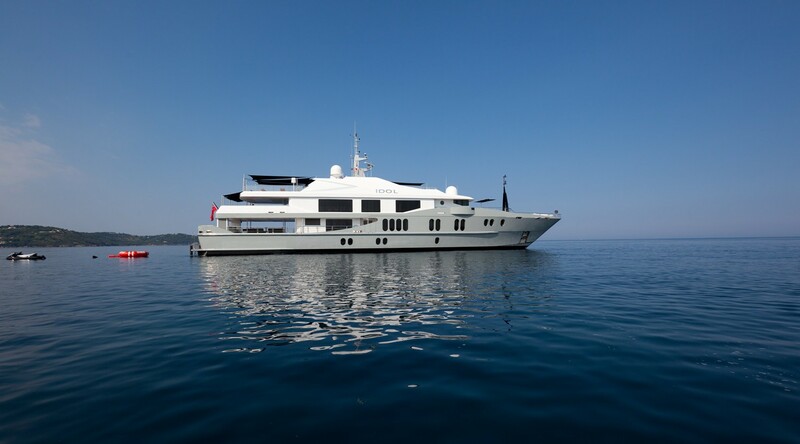 She comes with Quantum Zero speed stabilizers, for at anchor comfort, a Helipad up to EC 135, a deck Spa Pool, and a Teppanyaki grill on her upper deck. 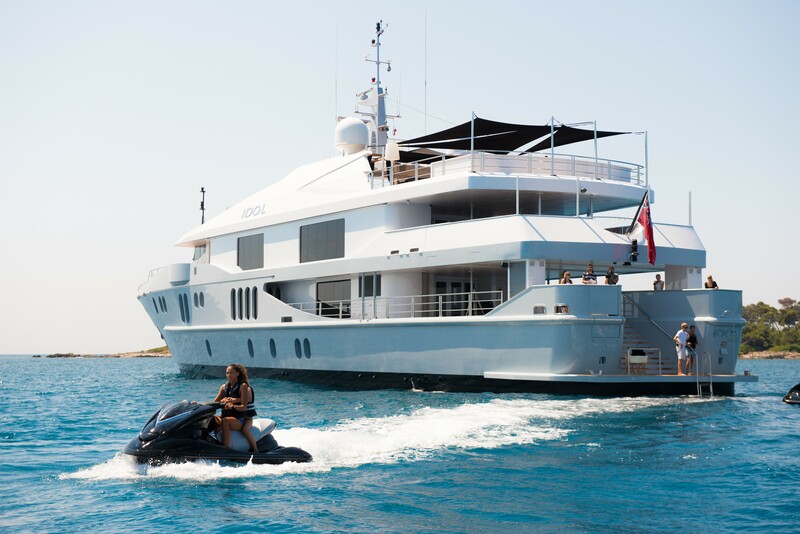 She also has a Gym with 1 running and 1 rowing machine, free weights, skipping ropes, exercise mats & ball as well as various water toys (see below for full list). 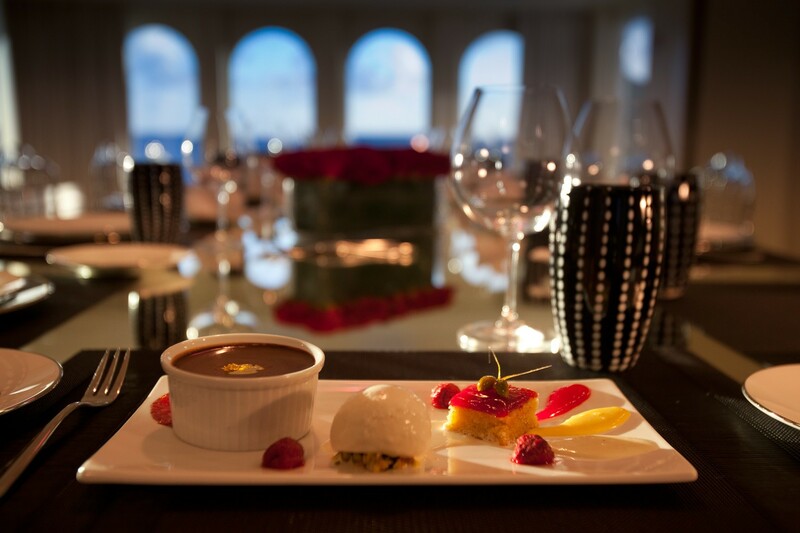 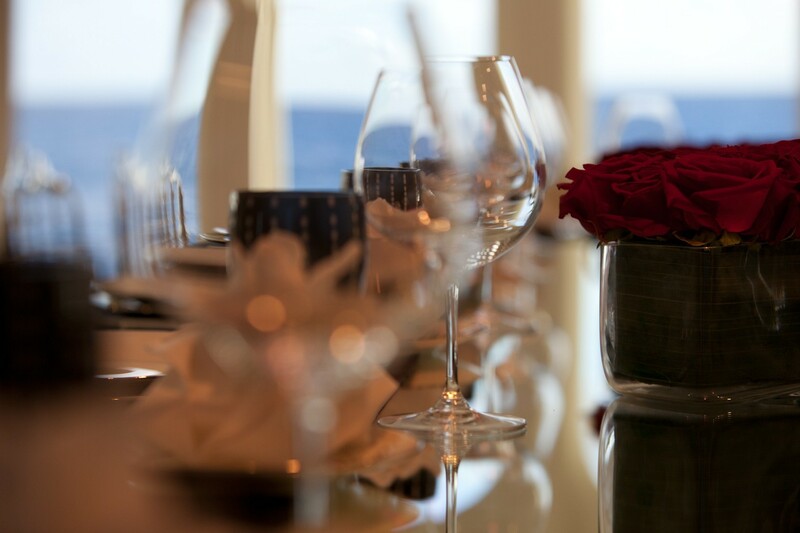 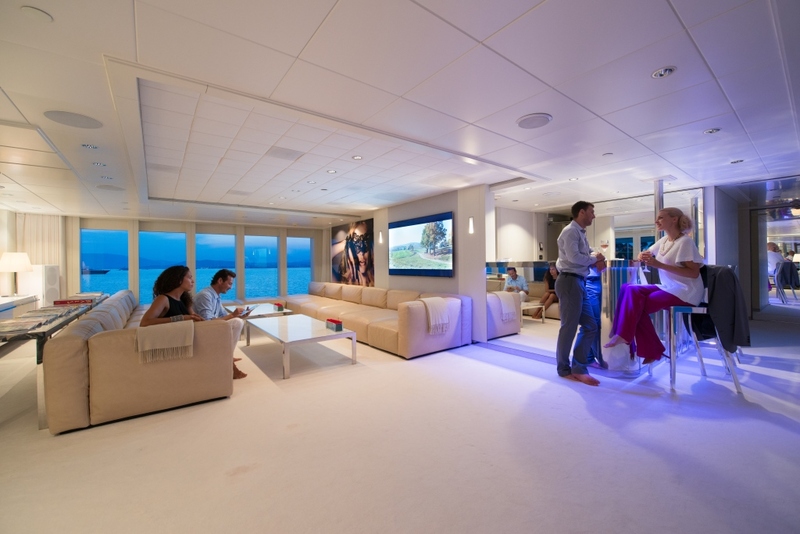 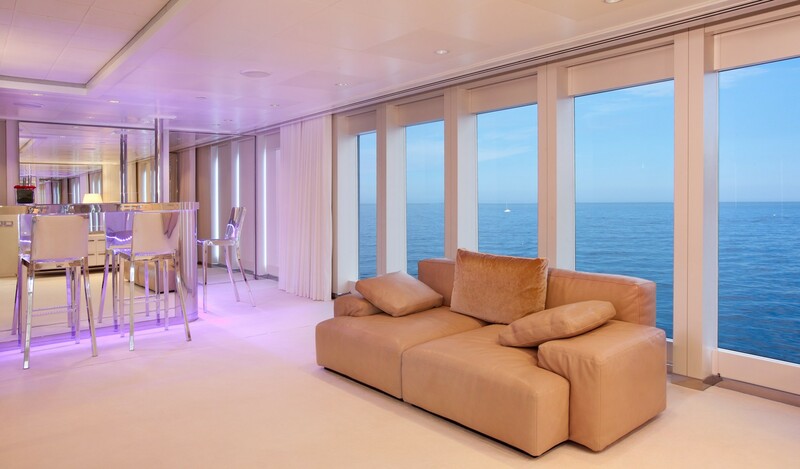 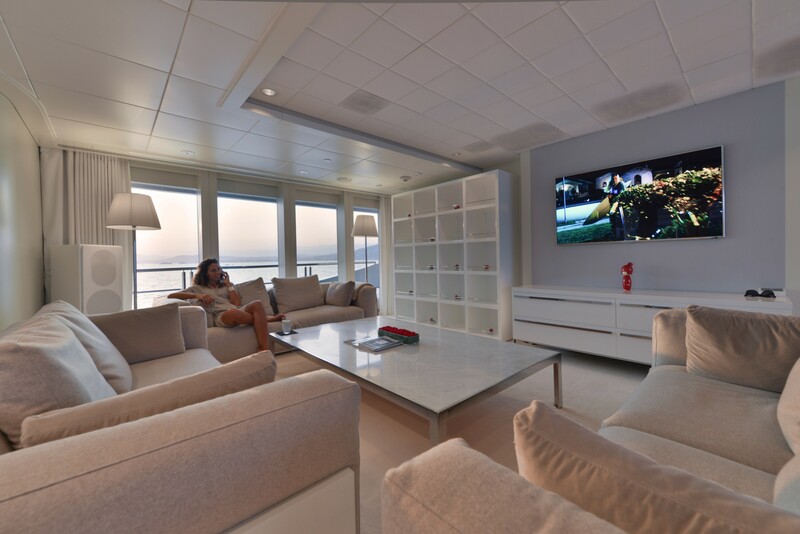 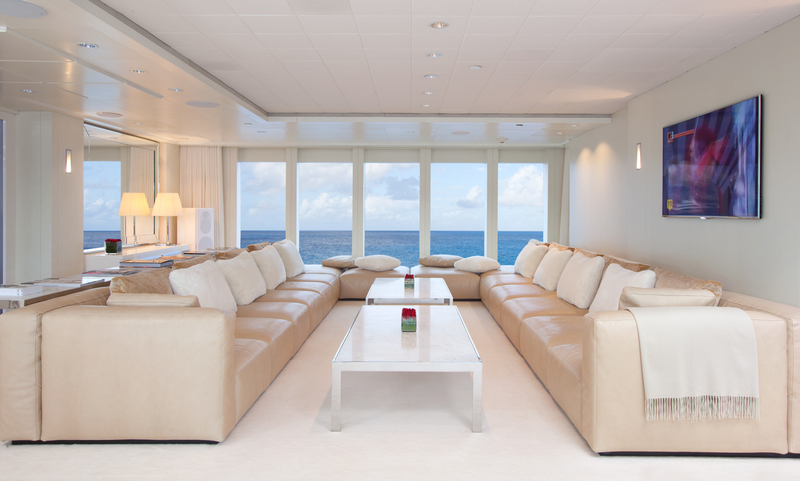 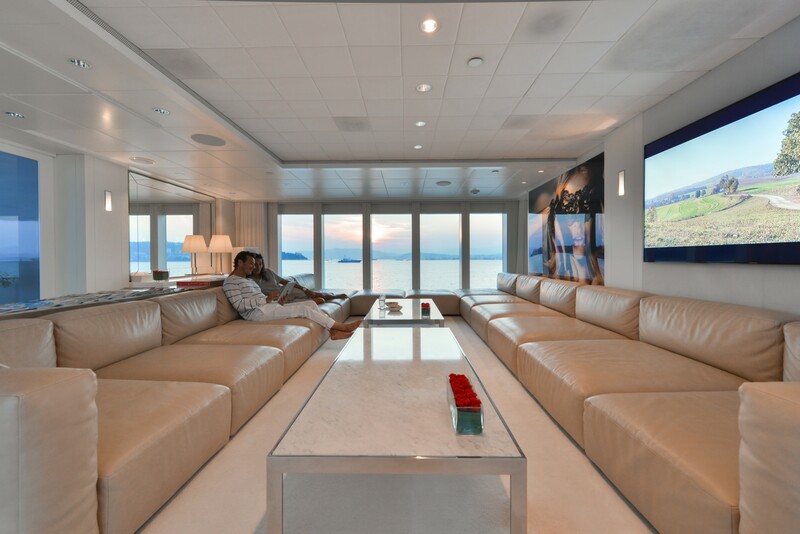 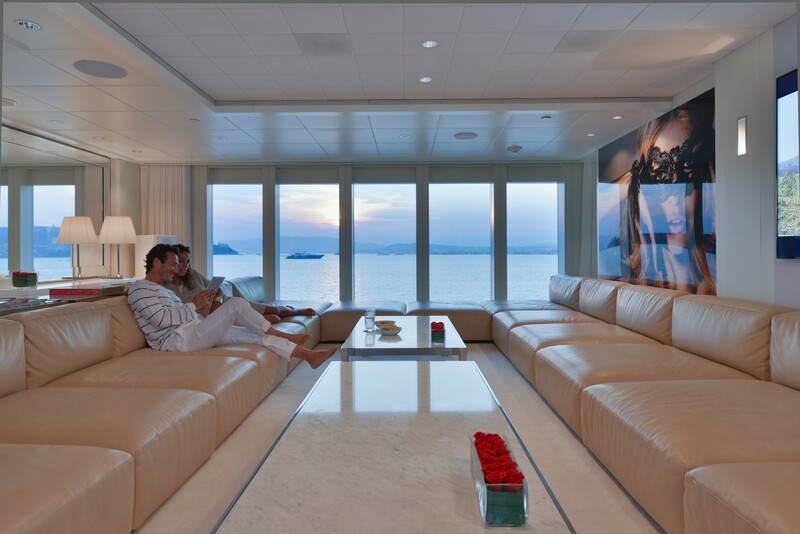 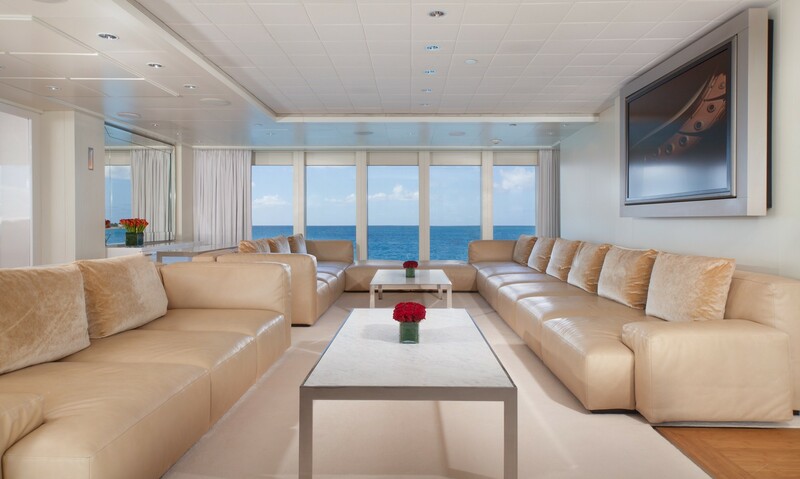 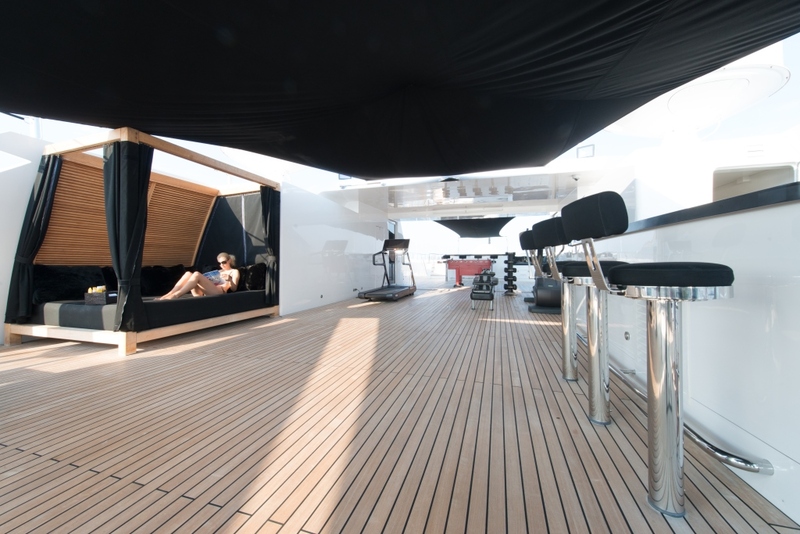 Guests will enjoy reclining on the leather sofas and lounging in the bar area available on the upper deck, which is also perfect for entertaining and dining al fresco. 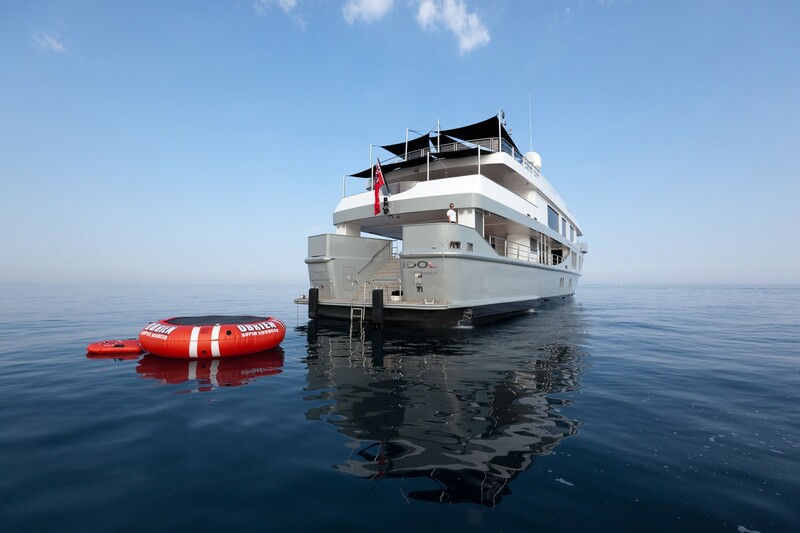 She also offers a VSAT Internet connection with WIFI distribution throughout the boat. 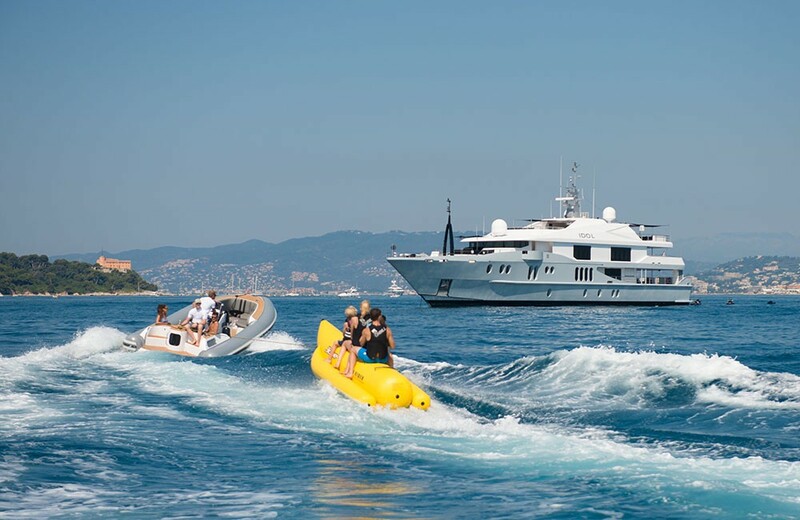 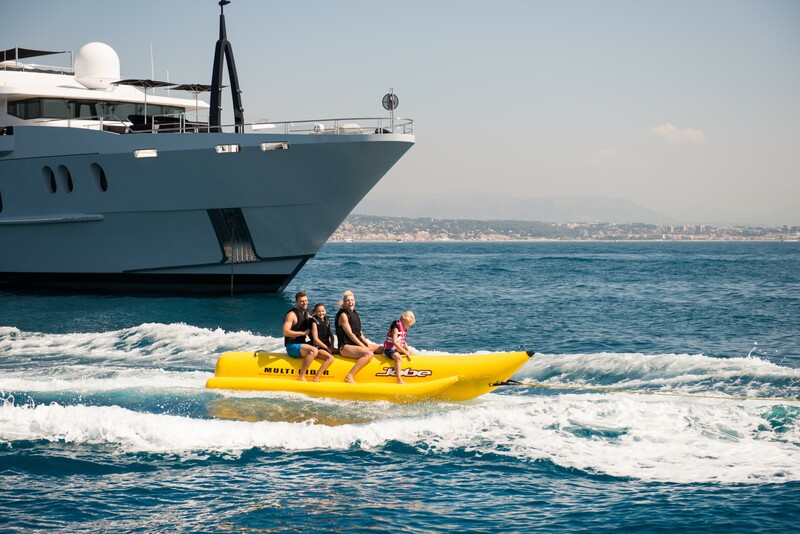 She has a very impressive top speed of 20 knots which is perhaps not surprising since she is a superyacht which comes from Austal – a shipyard which is often associated with fast ferries. 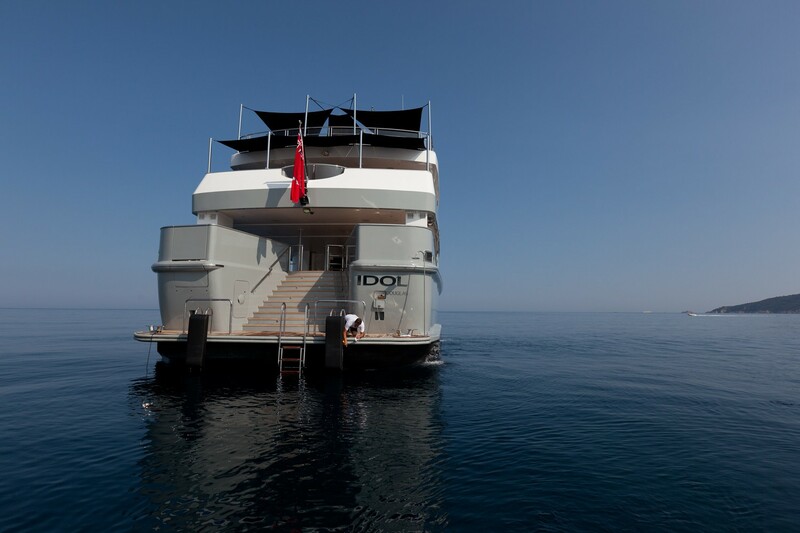 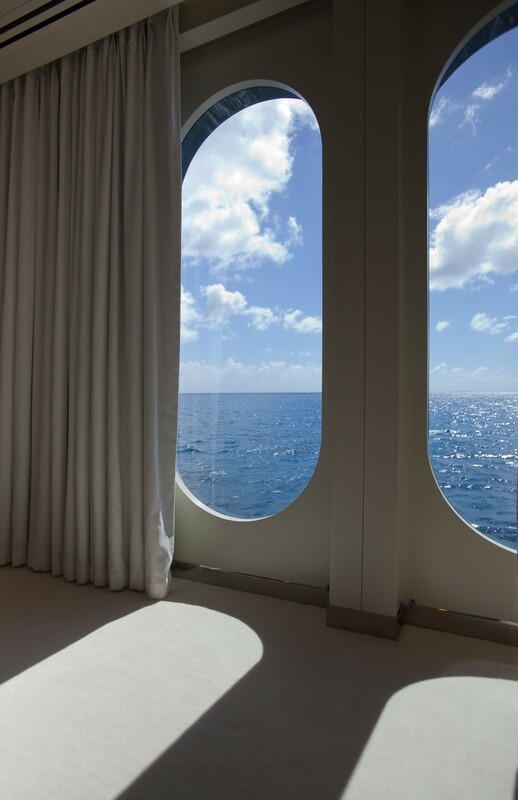 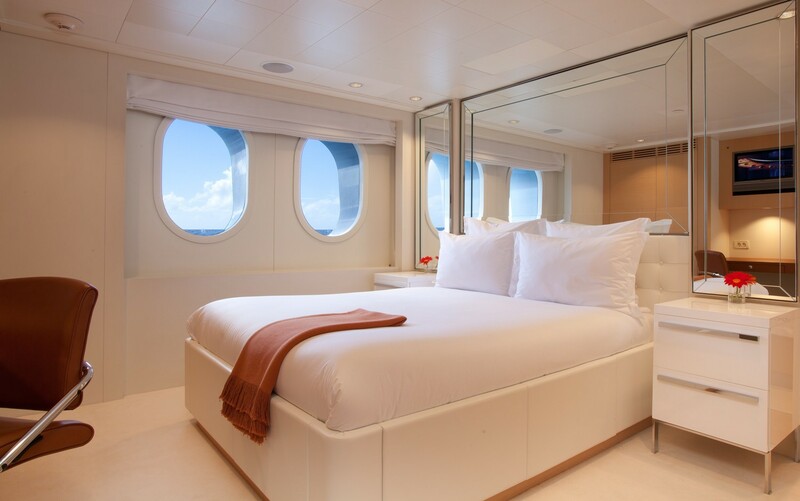 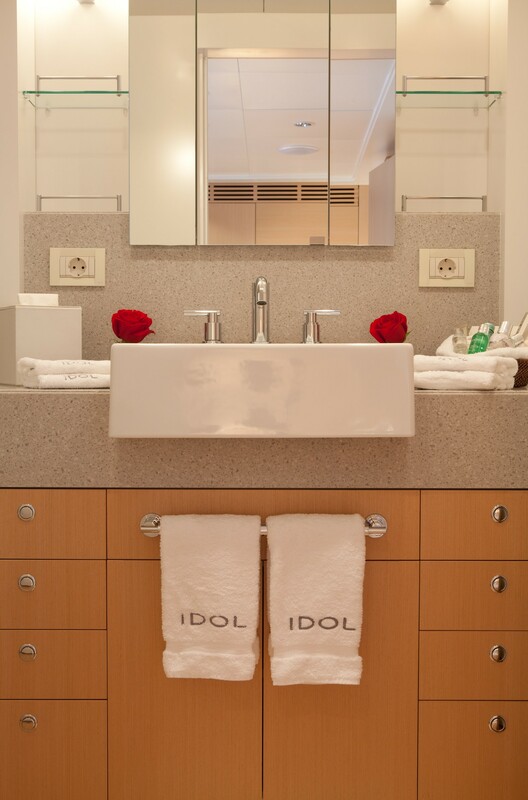 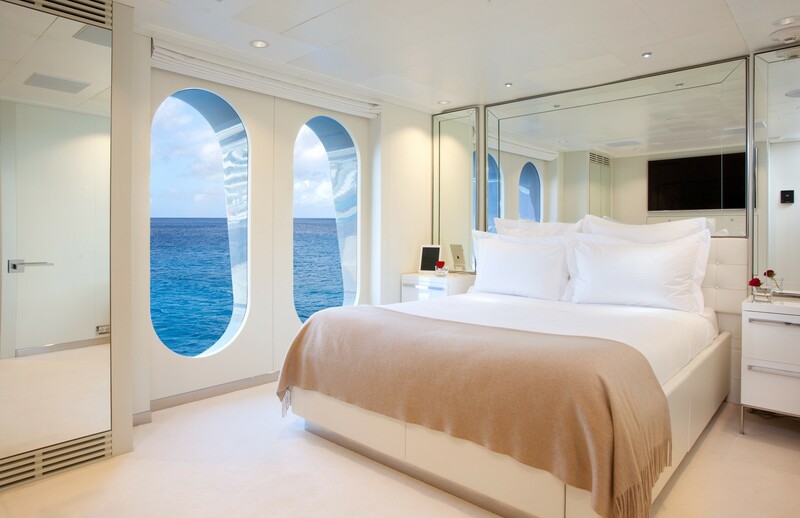 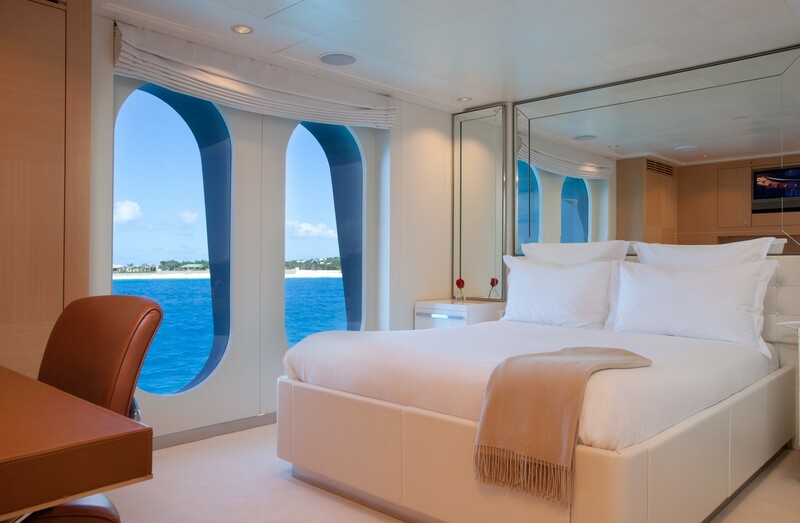 IDOL has three spacious double cabins below on lower deck. 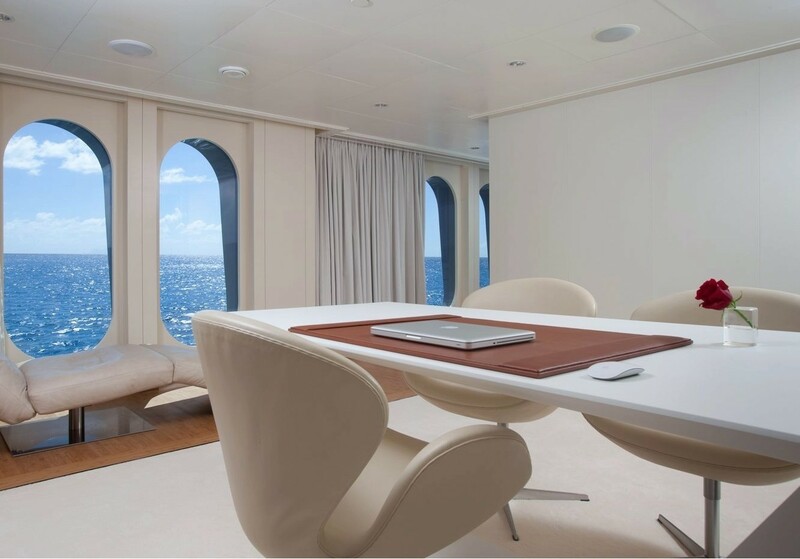 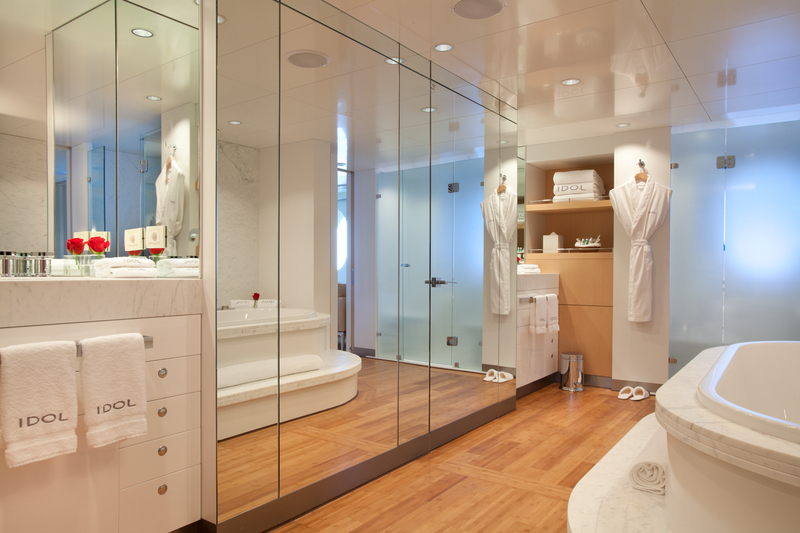 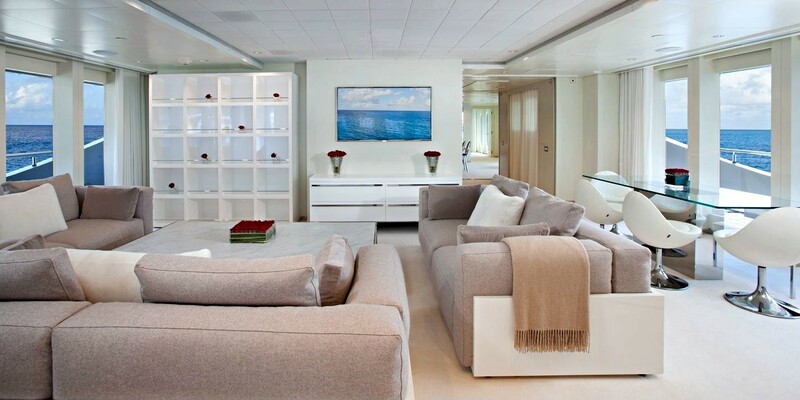 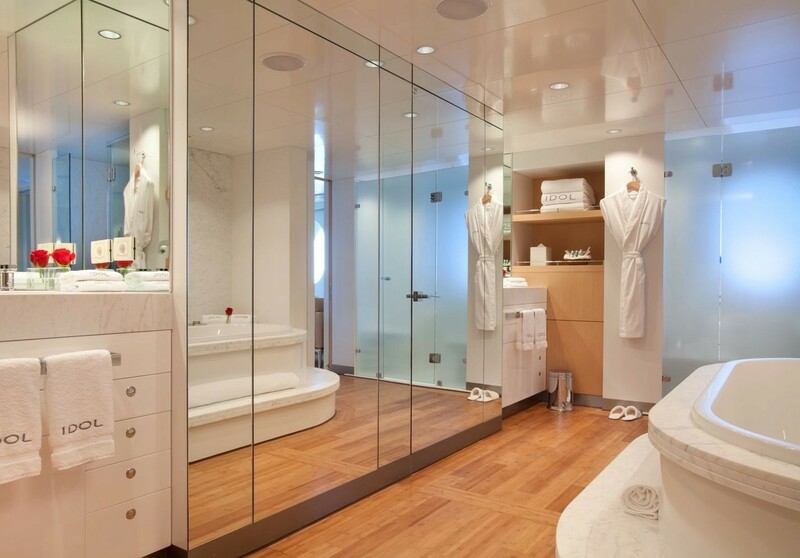 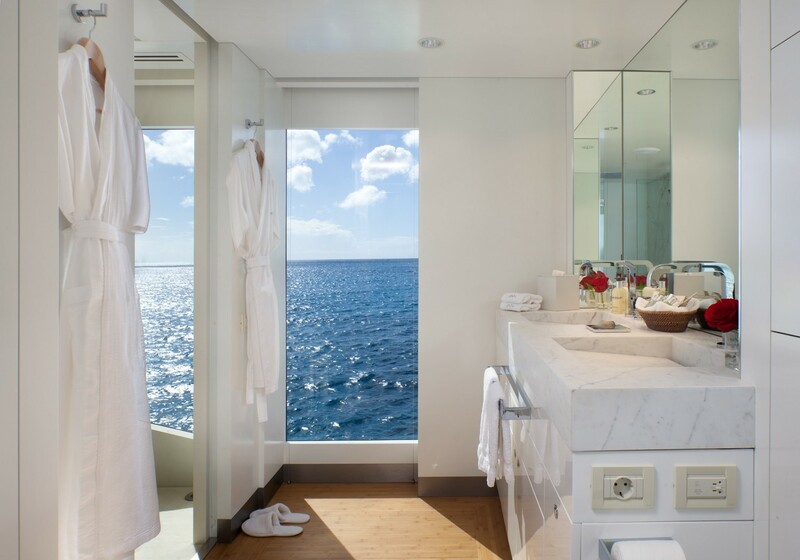 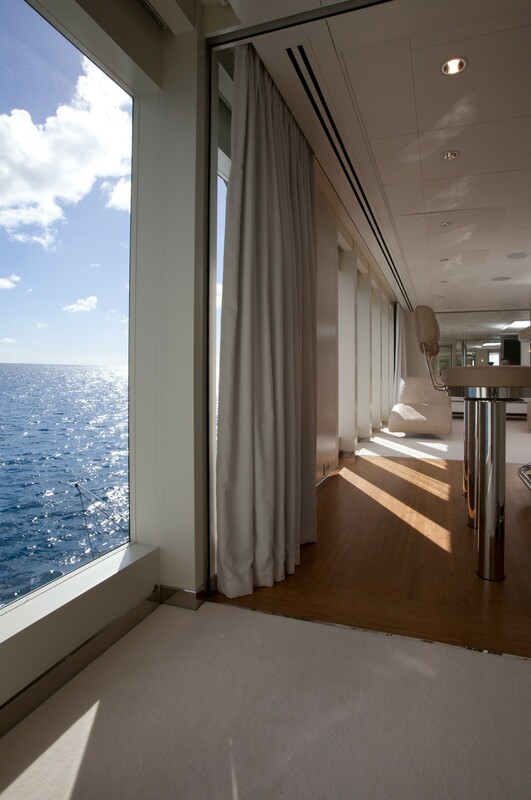 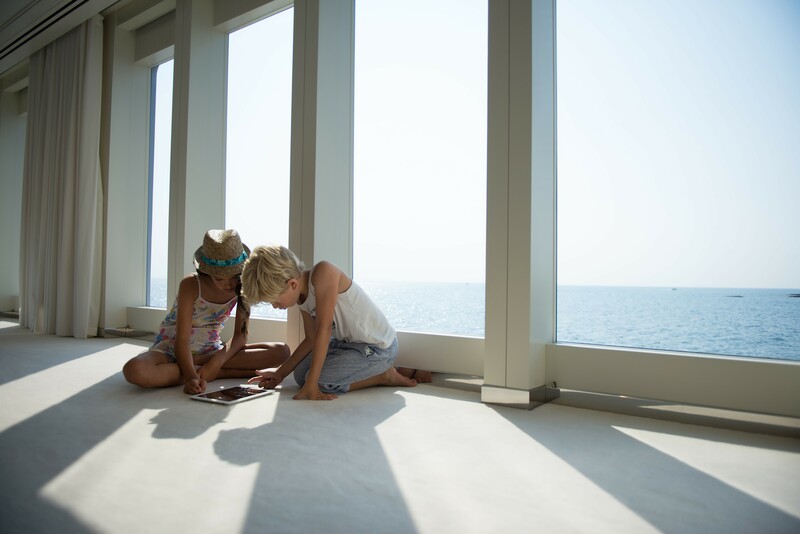 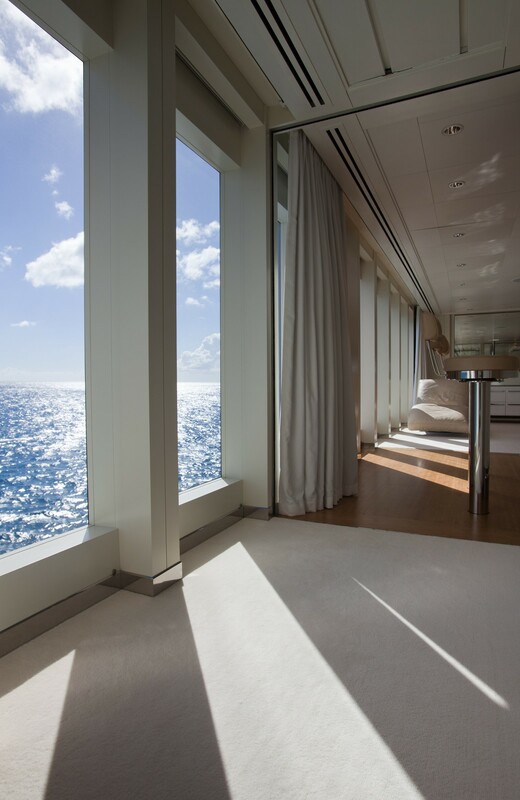 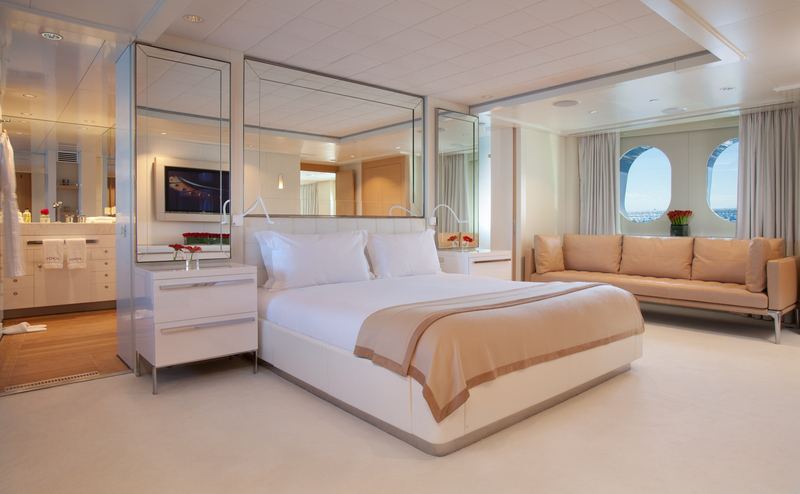 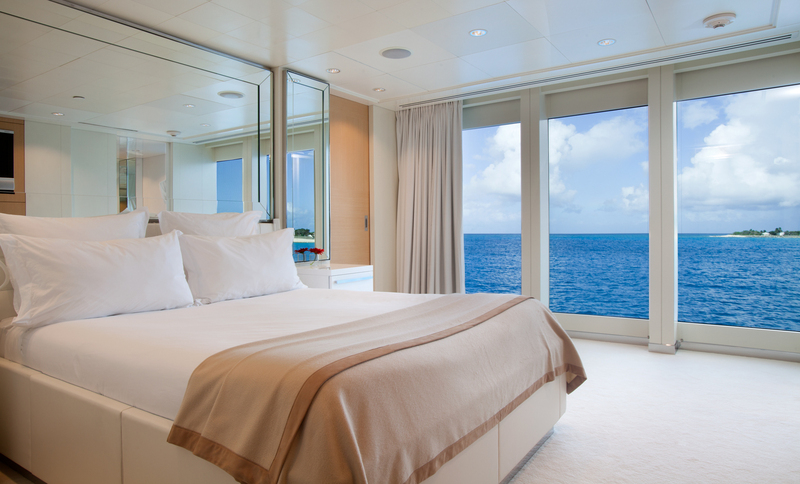 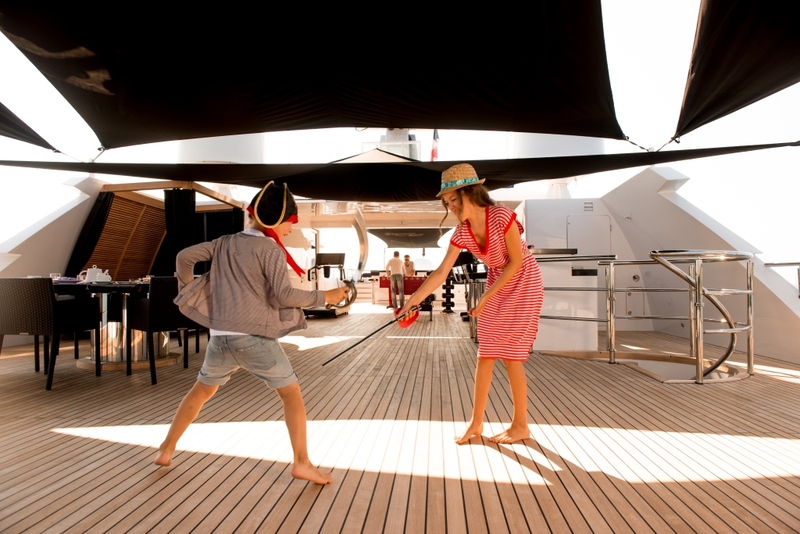 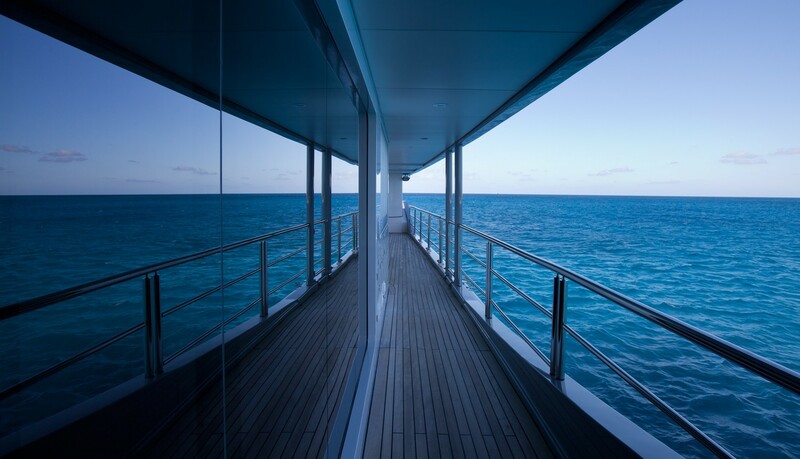 The beautiful master cabin is full beam on the Main deck and inter connecting to a study and guest cabin. 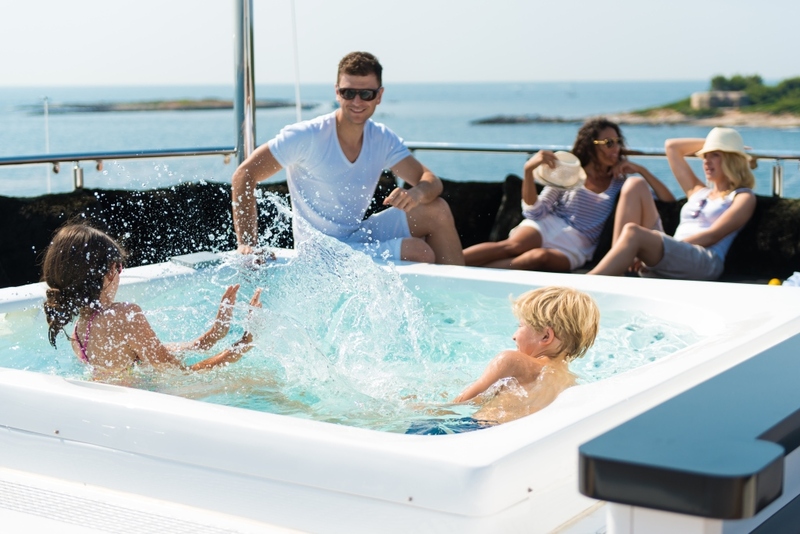 It comprises a spa tub, shower and bidet in its ensuite, as well as another ensuite bathroom with shower, ideal layout for families with small children. 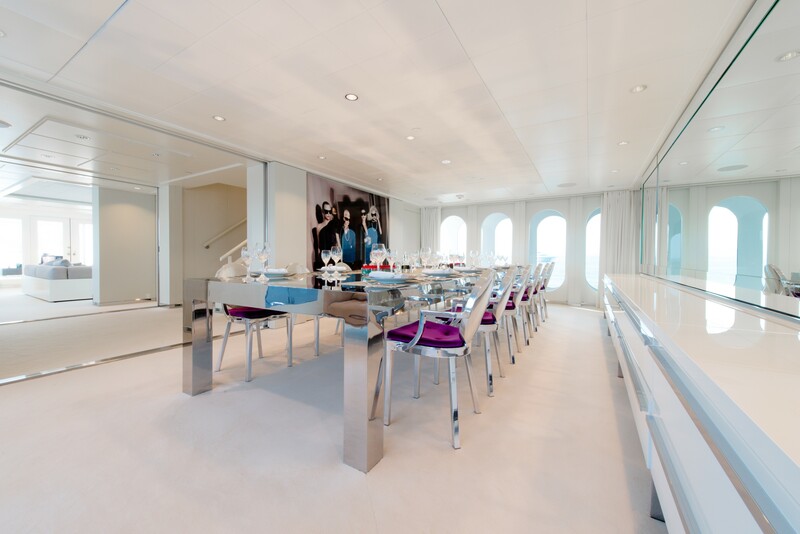 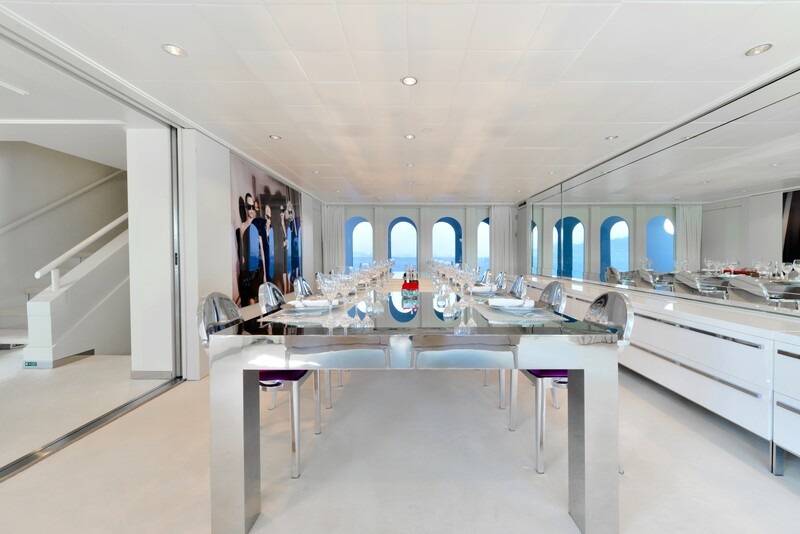 Two VIP cabins can be found on the Upper deck The gym also has two Pullmans. 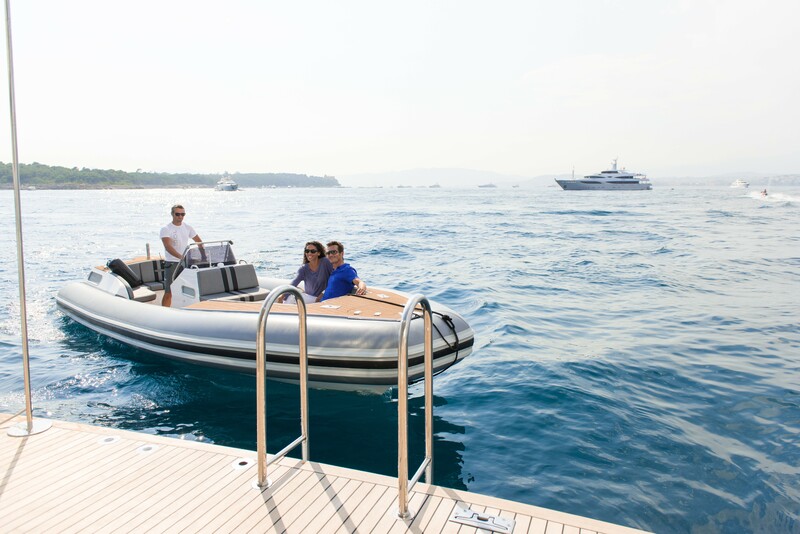 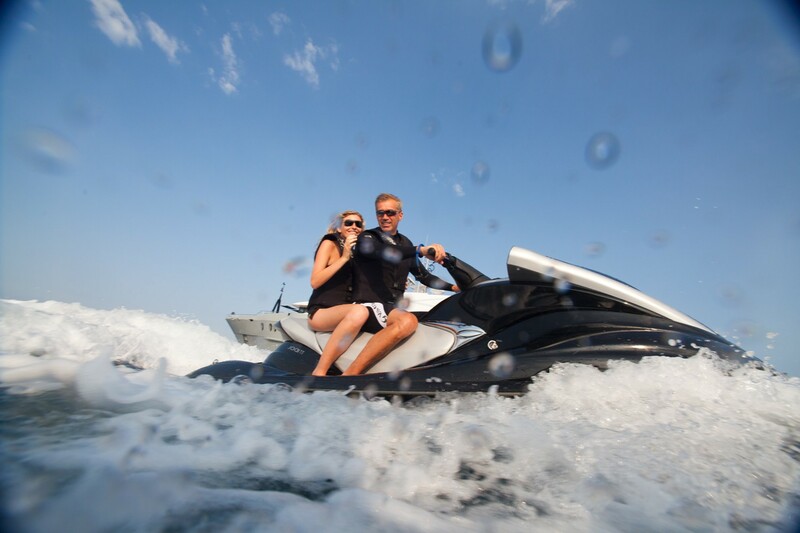 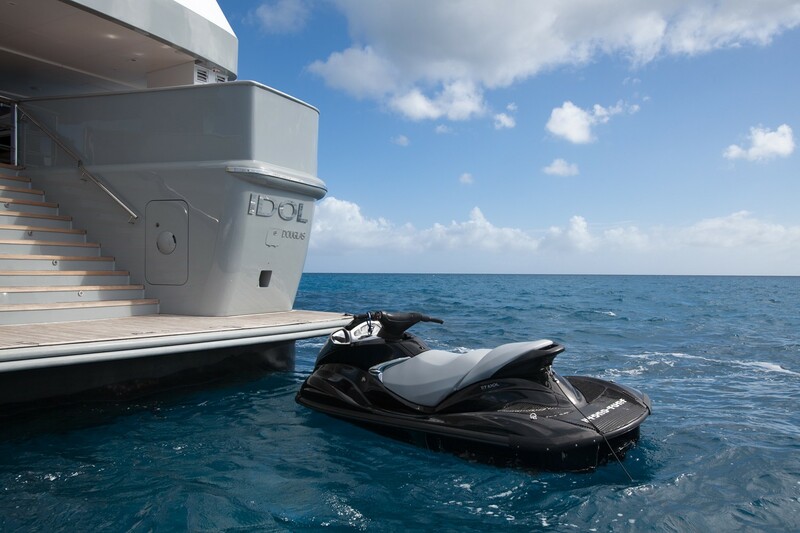 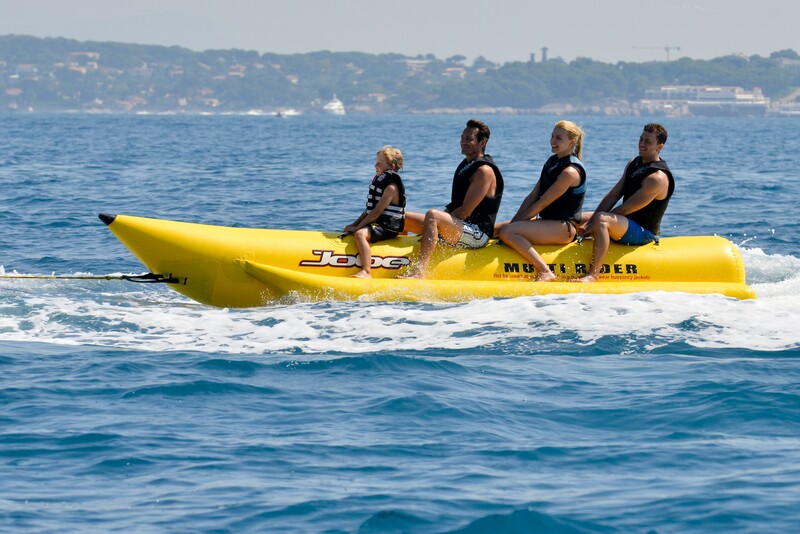 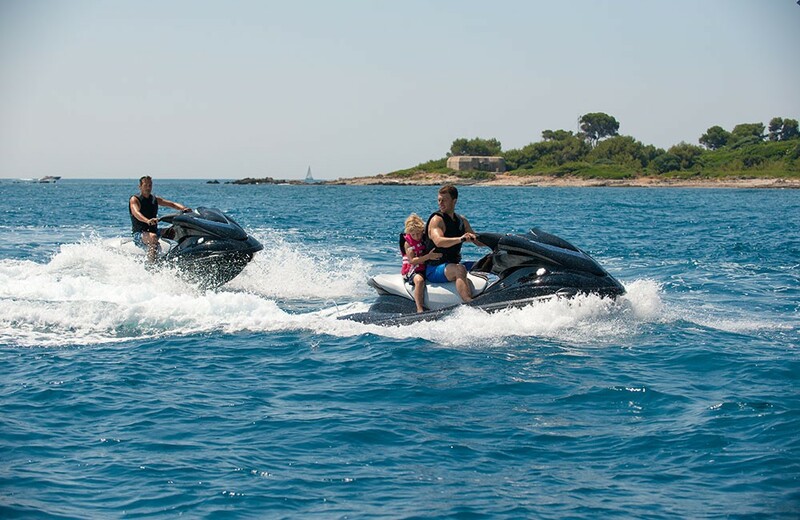 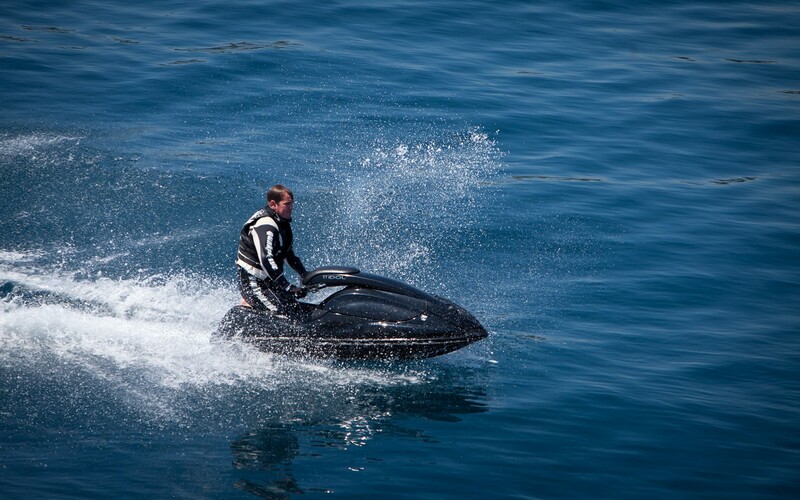 IDOL has the following Tenders & Toys: 1 x 7.8 metre Naiad tender 1 x 7.2 metre Nautica Express tender 1 x Zodiac rescue tender WATER-TOYS: 2 x Yamaha FX 1300 Jetskis (3 seaters), 1 x Kawasaki Jetski 800 SXR (stand-up) 2 x Seabob underwater jet scooters Assorted inflatable toys, wakeboard, kneeboard, waterskis. 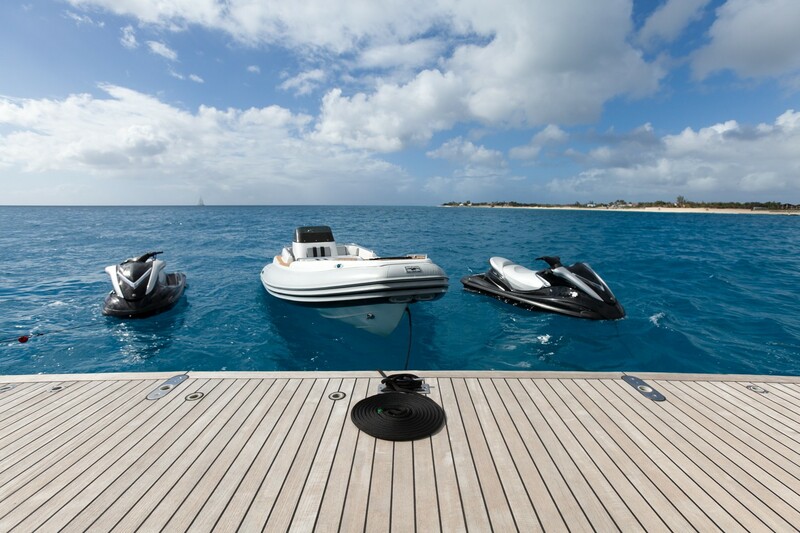 4 x complete sets of diving equipment with extra tanks 1 x Bauer dive compressor, Complete inventory of snorkelling and diving equipment Complete fishing inventory GYM EQUIPMENT: 1 running machine 1 rowing machine 1 exercise bike Free weights Skipping ropes Exercise mats & ball 50k Boxing Bag with gloves. 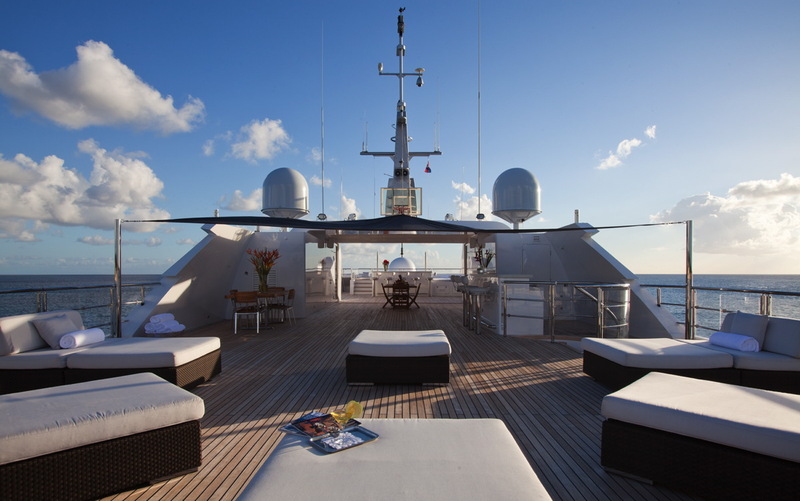 Audio Visual Equipment and Deck Facilities Quantum Zero speed stabilizers Helipad up to EC 135. 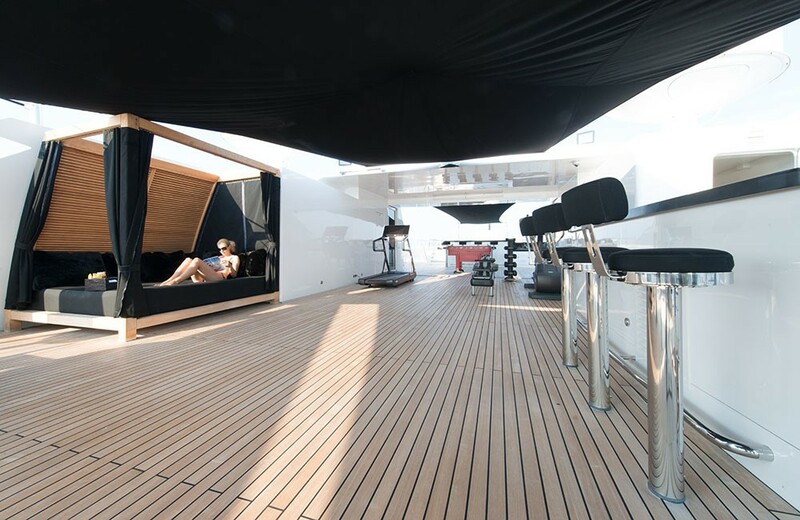 Spa Pool Tepanaki Grill on Upper deck Gym with 1 running and 1 rowing machine, free weights, skipping ropes, exercise mats & ball. 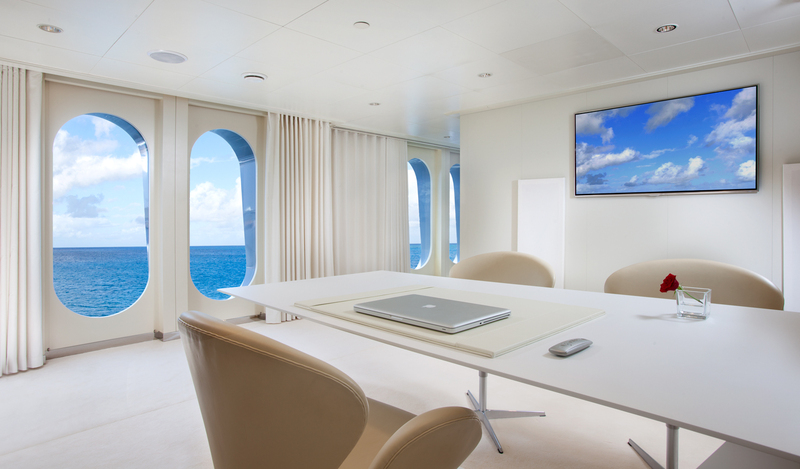 Communications VSAT Internet connection.